I was surfing Hulu recently for something interesting to watch and happened upon FREQUENCIES, a film the description indicated is a "science fiction romance." Initially, it was the poster that caught my eye. The image depicts male and female hands reaching toward each other and so promised romance, or at least a character-driven and relationship-focused story. I was like, "Cool, a new SFR film!" I was only a little surprised I hadn't heard about it before, but after all, the world is a big place. And I loved the sense of discovery that came with learning about a new-to-me film. I began watching it. Then, at one point, a character wrote the letters "OXV" on a blackboard. That's when I realized I had heard about this film—that is to say, when it had another title. This film had originally been titled OXV: THE MANUAL, and I had shared it on TGE a couple years ago. Thank goodness for streaming technology or it might have been even longer before I watched it. Someone, probably the distributor, had decided to change the name. I'm not sure how well it works given that "OXV" ties very specifically into the plot. Perhaps they thought "OXV" in the title would give something away? Difficult to say. 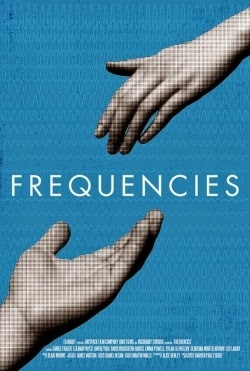 I personally like the original title better, but I can understand how "frequencies" is less cryptic. In a world where relationship, connections, and life worth is determined by predestined "frequencies", Isaac-Newton Midgeley, known as Zak, is a low born that attempts to change his fate by attempting to start a relationship with high born savant, Marie-Curie Fortune. It's interesting how the recent-ish batch of sci-fi romances I've watched either fall into the comedic category (e.g., SAFETY NOT GUARANTEED) or the cerebral (e.g., FREQUENCIES, PERFECT SENSE), or a mixture of both (THE ONE I LOVE). It makes sense given the limitations of low-budget films, but I still would like to watch a wider variety. I wasn't sorry I saw FREQUENCIES, but I'm sorry I didn't enjoy it as much as I'd hoped. Part of that is because it seemed to me the story veered toward SFR being a means to explore certain themes rather than the central point. So I had difficulty fully engaging with the romance as a result. Independent films are difficult enough to do, let alone do really well, so I usually give them the benefit of the doubt. In that sense, FREQUENCIES is worth watching if you can see it for free or through a streaming subscription. And if Darren Paul Fisher does another SFR film, I'd definitely check it out. Learn more about FREQUENCIES at the official site.